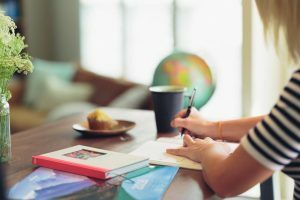 I would love to share with you how I bring mindfulness into my morning routine. From the moment we open the first two gifts of the day (our eyes) we start channelling and manifesting the flow of the day. There is a lot of truth in the saying “ Don’t get out of bed on the wrong foot”. From the moment your alarm wakes you up (or you wake up by yourself), the way you pay attention is important. Are you dreading getting up? Are you snoozing the whole time? One thing that helped me enormously was not snoozing my alarm anymore. I started setting my alarm 15 min later to get additional quality sleep and when I wake up, the first thing I try to do is journal my dreams if I can remember them or the feelings that I woke up with because sometimes the memory of the dream fades away but the feelings stay. Then I also write down 3 things I am grateful for. I put my hand over my heart space and greet myself and on the days I have the courage I tell myself: “I love you”. A lot of people take a shower to help them wake up in the morning so let’s have a look at how we can bring mindfulness into our shower routine. We shower to clean our bodies, but have you ever thought about cleaning your energy body as well? Events, emotions and feelings all carry a frequency and attaches itself to our energy body. It is good to remove old frequencies that no longer serve you to make space for better things.Water is an emotional element, so use this knowledge when you shower. As you wash yourself bring into your mind’s eye how you are washing away all the negative emotions and events as well. If you are familiar with shower meditations, this is also a very good way to bring mindfulness into the shower. Just be present. The shower used to be one of the places I loved to think, but I realized that when I tried to conquer the world and find a solution to every problem that arises in my thoughts during that time, I don’t feel refreshed after I took a shower. I would just feel drained and I would shower for long periods of time searching for more answers and the feeling of refreshment. It was only when I became mindful in the shower and removed the problems from the outside world that I got the best benefit from something as simple as taking a shower. Bless the water as it flows over you. Not only for yourself but that same water running back to mother earth will recycle more love to Mother Gaia and the next person that uses it. Pay it forward. It is done with one small mindfulness act at a time. 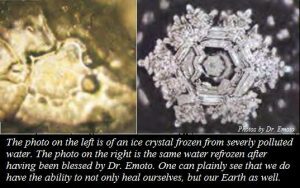 (There is a lot to find out about the change when you bless water – if you feel like it, find “Masaru Emoto” on the internet). 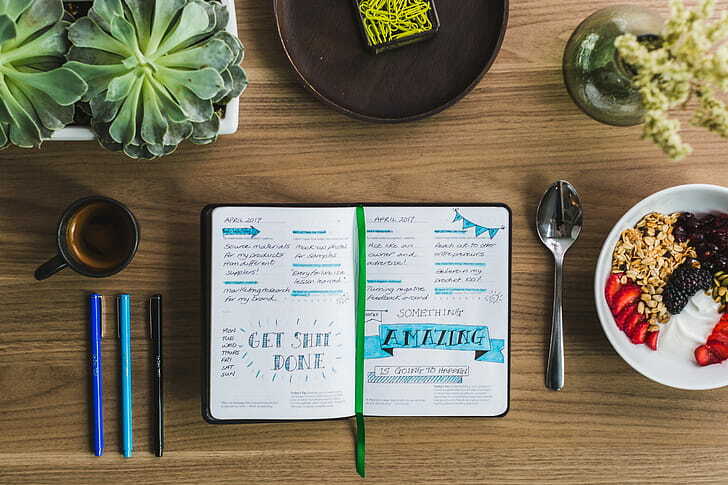 While enjoying breakfast, I then write in my diary my intentions for the day. It always includes the feelings, actions, and intentions I want to attune to for that day. If I have an important task, I write that down to complete it with ease. The rest are just mindfully flowing. We can bring mindfulness into everything we do. It adds so much to your day. The first step is to realize what is in your mind while doing these things. Accepting it with kindness before you try to realign with another way of going about it. 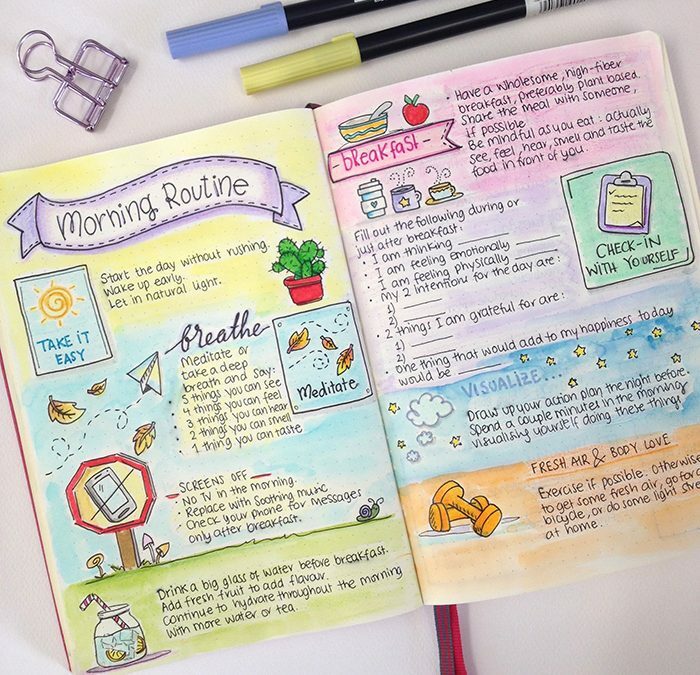 See what works for you to find a morning routine that sets up your day in a mindful way!